“But it’s only the 4th of January”, you may well be thinking, but when it comes to chillis and peppers, you really can’t start too early, especially when you consider that it can take several weeks for chilli seeds to germinate, or the fact that realistically there is only a short ripening window. No, the sooner you start chilli and sweet pepper seeds off the better in my humble opinion. My tomatoes won’t be that long behind either but they’re a bit trickier, as they have tendency to legginess (is that a word?) 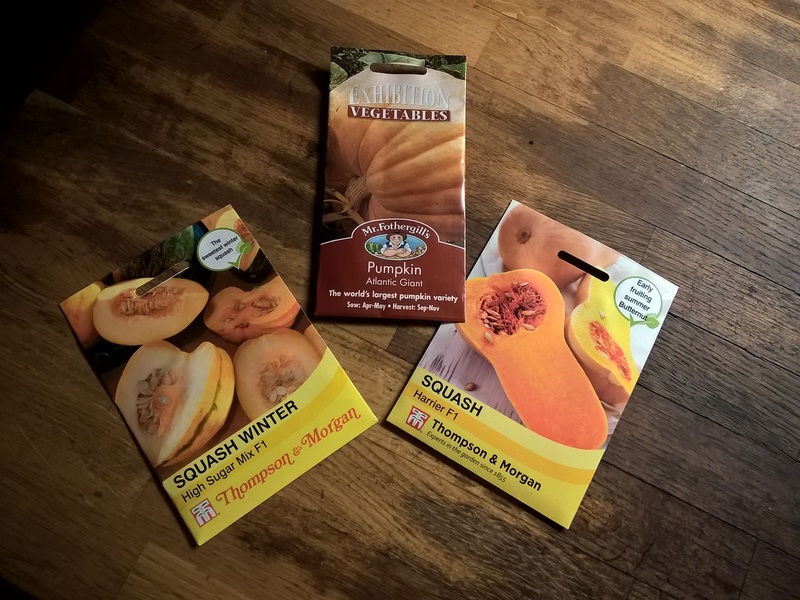 if kept in the house too long BUT I will struggle to get them ripe before the end of the growing season, if sown too late. But I digress! Back to my purchases. was the arrival of my much needed hair appointment to change my shaggy dog look into that of a sleek professional. Not that I ever look sleek, it has to be said, being blessed as I am with super thick hair, which has a preference for frizz at the slightest provocation, has an annoying ‘kink’ which can only be fully controlled when shorter and thinned out. That said, my stylist is a miracle worker and manages to shape my locks into a more manageable mane. the need to buy new school shoes for Little Mudlet. Unfortunately, our local market town does NOT have a shop which sells children shoes, well not shoes for children with a shoe size larger than a childs 3 ….. in fact come to think of it you’d be hard pressed to find adult shoes without first either expending diesel and visiting the much larger Scunthorpe OR visiting the garden centre. Yes! You read that right. The best place to buy womens’ shoes WITHOUT trailing all the way to Scunthorpe, is to take a jaunt down to the local garden centre and see what they have. So with my hair appointment concluded and my shopping done, Little Mudlet and I traipsed over to the Garden centre. I figured that as she is, apparently, now in an adult size, I might just find a suitable pair of shoes for her and, thankfully, I did! Unbelievably there were several pairs of shoes, in her size that looked like school shoes and she loved one pair AND they fitted her and so we bought them and then decided, that as we were there, we’d have a mooch and see what seeds were available. If I could find the seeds that is, as the Garden Centre is having a bit or reorganisation and we couldn’t find the seeds anywhere. We found candles, jewellery, jigsaws, very expensive teddy bears, Christmas sale room, furniture, fish, pet supplies, weed killer, Lego, other toys, books and clothes!!! There was even a restaurant where full Sunday lunches, sandwiches, snacks, salads, cakes and various beverages could be enjoyed. But could we find the seeds? Nope! Maybe the seeds were in the main plant hall, although I thought it might be a touch cold in terms of storage but we still couldn’t see any! “Maybe they haven’t got any,” Little Mudlet suggested doubtfully. Spotting a customer assistant, I asked the whereabouts of the seeds. He laughed and told me that my guess was as good as his and that he didn’t work in the plant section. Maybe they’re by the tills he suggested but they weren’t. In exasperation I asked one of the ladies at the till if she knew where the seeds were. Well of course they were! That’s exactly where I would expect to find the seeds. NOT with the compost, seed trays, hose equipment, plant food and gardening tools etc. Nope next to the cashmere jumpers, tops and blouses. Another packet of the Curry Chillis because they were such a success last year and are so extremely hot that even Mud was taken by surprised and rapidly reduced the number he used in curry and chillis, when he realised that his usual 3 or 4 created a monster of nuclear strength that could help a jockey ‘sweat’ of several pounds of weight in a few short seconds. I’ve never seen him turn that particular shade of red before! 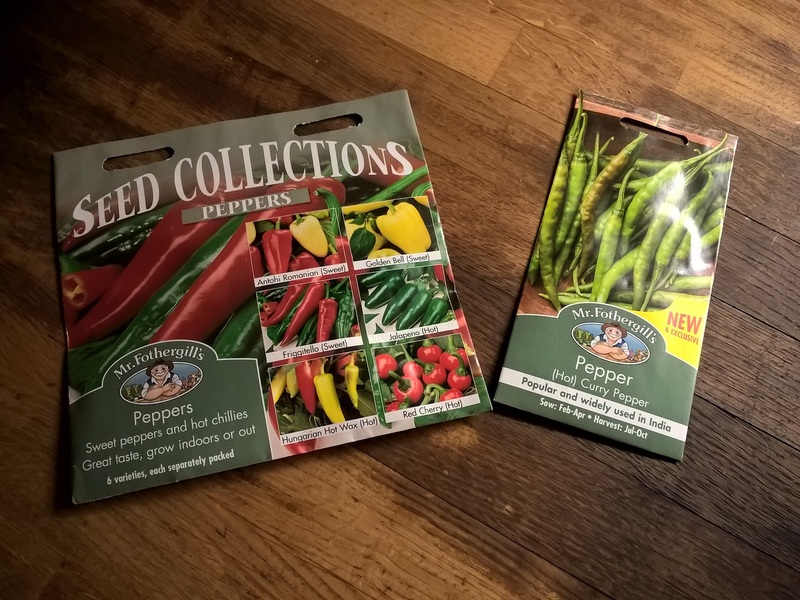 A Fothergills Seed Collection Peppers selection which includes, three sweet pepper varieties (Antohi Romanian, Golden Bell and Friggitello) and three hot chilli varieties (Jalapeno, Hugarian Hot Wax and Red Cherry). Winter Squash mix which is an old favourite of Mudville but I’ve had mixed results with. An early summer fruiting Butternut Squash variety Harrier F1. Another packet of Atlantic Giant Pumpkin seeds. Hopefully we’ll have better luck with these this season ….. if Ma Nature plays ball that is. Little Mudlet spotted a very strange looking tomato variety Shimmer F1 and we agreed to include it even though it looks distinctly odd and I’m not at all sure I’ll be able to figure out when they’re ripe enough to eat because they appear to retain some green in their skin. 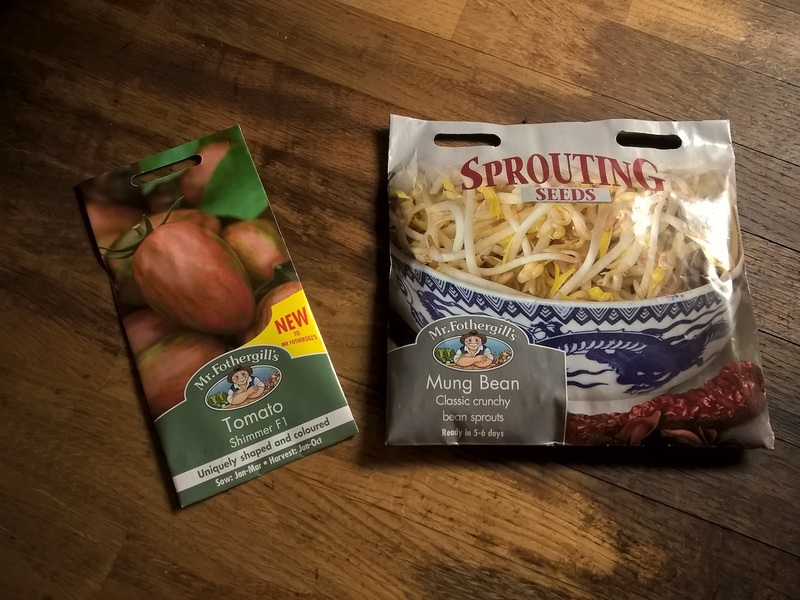 And for a bit of fun we bought a packet of Mr Fothergills Mung Bean seeds so we can try growing our own Bean Sprouts for stirfries. My 84 cell seed tray kit. I need to check through my seed tub to see what we still have and what we need to get fresh this year but I knew we were low on chillis and peppers hence the buying spree today. 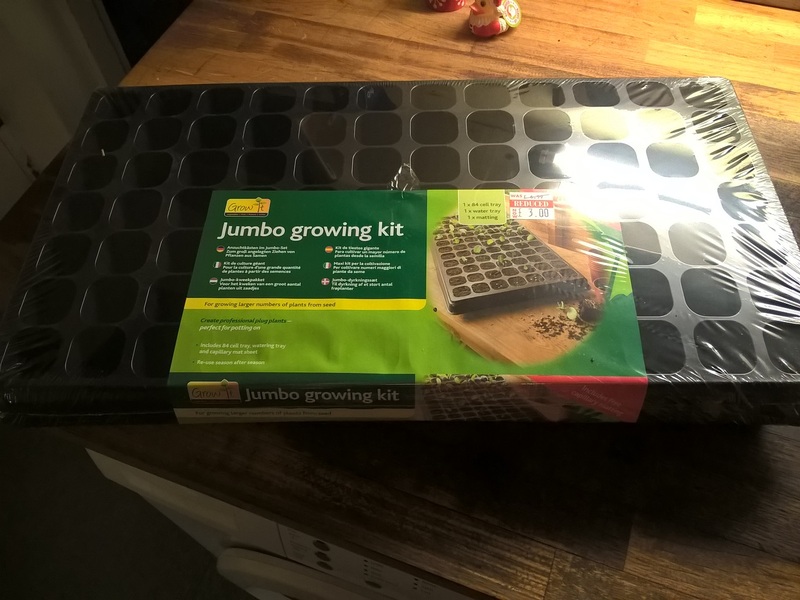 In addition to the seeds I also got a bag of seed compost and an 84 cell seed tray kit which was also in the sale and was better than half price. It’s certainly big enough for all my chilli seeds and will fit on the wide kitchen windowsill. Tomorrow I’ll get the seeds started off and then the 2019 growing season will have officially begun in Mudville. Absolutely the right move for the new year!